Usually, on a Thursday night, I’m most likely to be found slumped motionless in front of Netflix (such is the life of a working mother- beware! 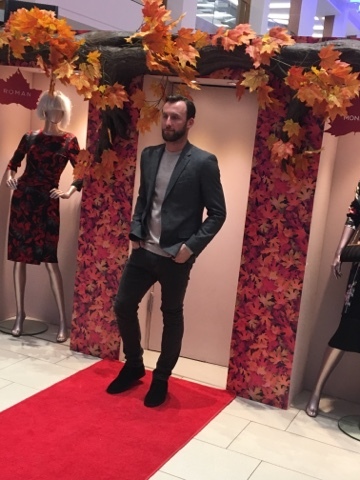 ), but last Thursday I actually got to do something a lot more exciting when I went along to the brilliant Intu Victoria Centre VIP Autumn Fashion Event. 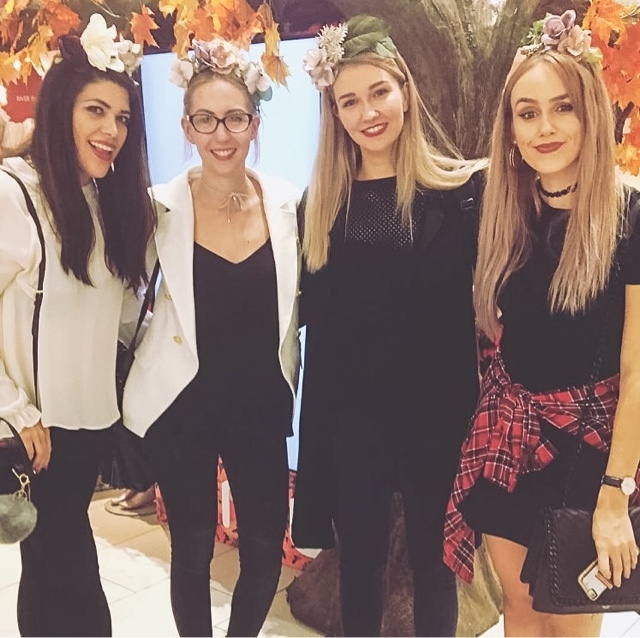 Now that the nights are darker, its acceptable to wear scarves and Pumpkin Spice Lattes are popping up of every street corner, most of us are looking forward to some autumn fashion. For me personally, its my favourite season to dress for. I find summer frankly confusing (especially with the schizophrenic British weather veering from hot sunshine to rain and gale force winds in the space of an afternoon), and the depths of winter often see me sacrificing style to stay warm, but autumn is my kind of season. 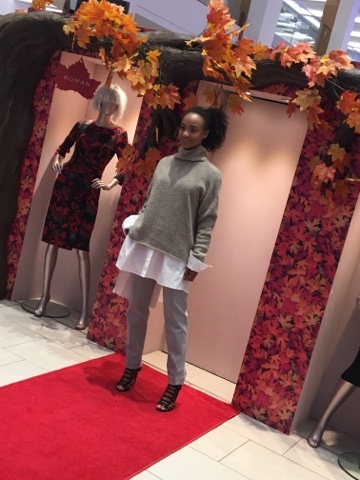 I love snuggly jumpers, leather minis and ankle boots. I love furry gilets and long-sleeve dresses and hats. Autumn is my time to shine! So it was brilliant to pop along to the Victoria Centre and see what the coming season has in store for us. On arrival, we were treated to delicious cocktails and nibbles from Thaikhun, a really funky bar-restaurant serving Thai street food, which just happens to be my favourite as well. 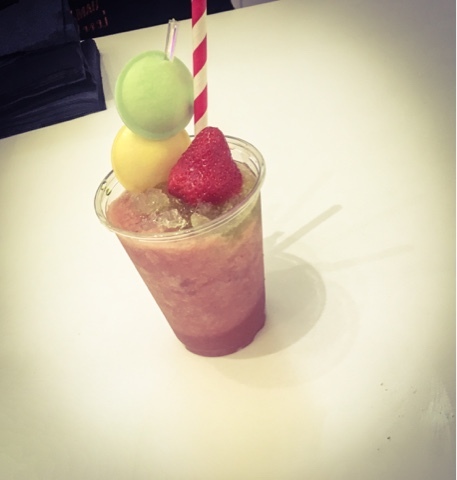 I couldn’t get enough of the fruity Midori cocktails that we could garnish ourselves (I’m a big kid, so I went for the flying saucers…) and the delicious Gai Satay skewers. The added bonus was that there were lots of vegetarian girls in attendance, so I got a whole platter of chicken pretty much to myself (evil laugh). The menu at Thaikhun is really fresh, and I especially liked the ‘Make Your Own Pinto’ option, which is a little like a stacked tiffin box full of a selection of different Thai curries delivered to city workers. Seb and I had our honeymoon in Thailand and I would dearly love to go back, so sampling some of the cuisine I could almost imagine I was back there. 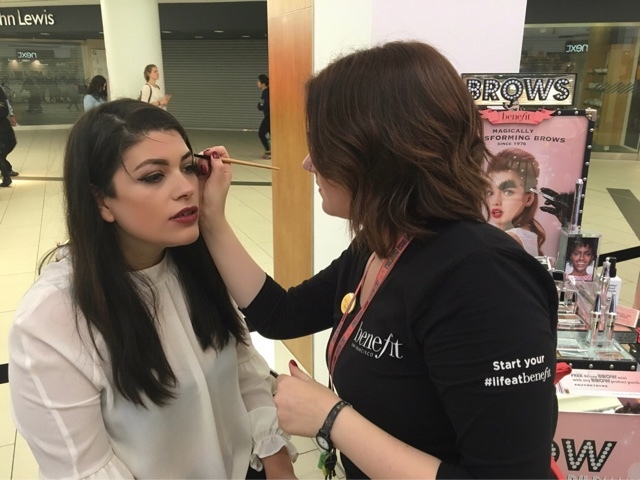 After I’d finished stuffing my face, I was treated to a brow makeover from the lovely peeps at Benefit Cosmetics. They’ve really come out all guns blazing on the brow front – not only do they offer a Brow Bar service on larger counters, but they’ve recently launched a suite of revamped products to tame those arches (in fact, you can check out my review of their Goof Proof Brow Pencil here). First of all, they explained how to map out the shape of a foolproof brow using ‘face mapping’. Taking an eye pencil or a make-up brush, line it up with the side of your nose. This is where your brow should begin. Then flip the pencil so it goes from your nostril in a diagonal line through your pupil – this marks the highest point of the arch. Then from the outer corner of the eye upwards is your end point. I learned that the tail of my brows are too short and look much better when they’re extended to this point. Best of all, I can recreate the look at home with my new knowledge. 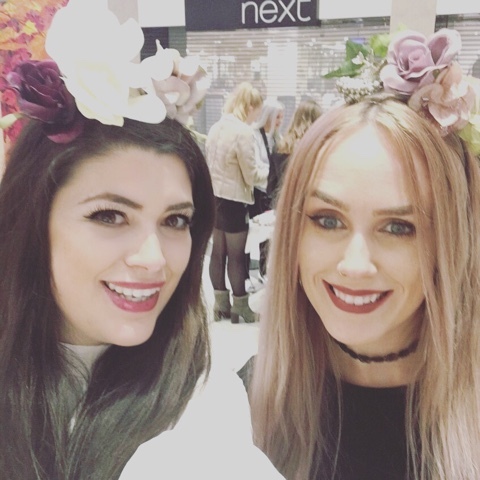 I got to try out some of the new brow products, including the BrowYo! Conditioning Primer, which not only grooms brows but contains a special protein gel to encourage growth and the Ka-Brow! Cream-Gel Brow Colour, which glides on to provide a smudge-proof, waterproof finish. The look was finished off with a little High Brow pencil to highlight and define. I absolutely loved the finished look! I never let anyone do my brows (seriously. Even my wedding make-up artist was elbowed aside when it came to them! ), but I was so pleased with what Benefit did. 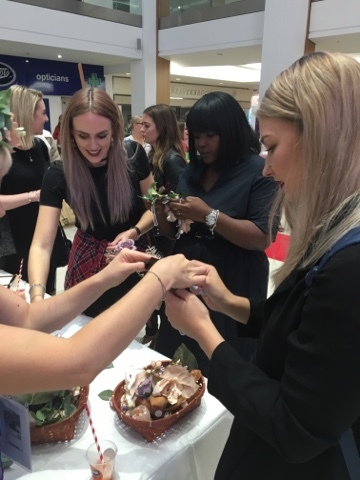 There were also makeovers on hand from Lancome, who were showing their new cushion foundation (look out for a review coming very soon on that! ), Clarins and Liz Earle skincare. 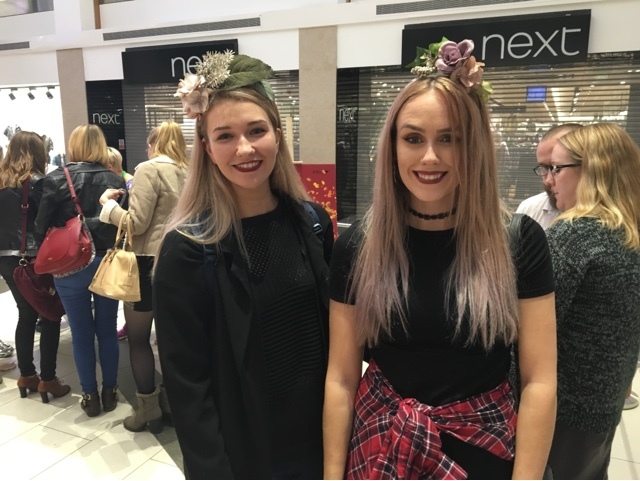 We also got to make our own flower crowns! I’ll be the first to admit I’m not very crafty but I really enjoying having a go at this and was quite proud of my creation – who needs a Snapchat filter when you have the real thing! 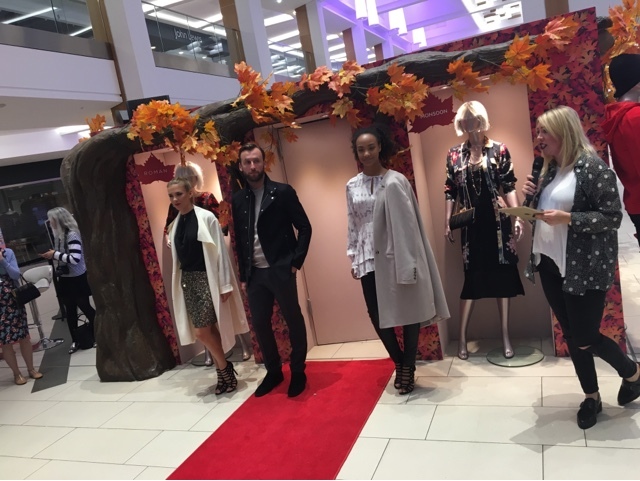 There was then a fashion presentation, which was a preview of what to expect as Intu kicks off some catwalk shows in its shopping centres over the next few weekends. And I fell in love with a new discovery – a label from John Lewis called Modern Rarity. The clothes were so, so beautiful – a perfect blend of directional and classic. Exactly how I want to feel. 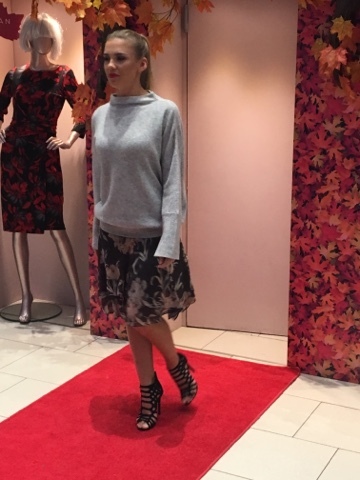 My best friend Taryn and I have a recurring joke because we both buy so many grey jumpers, and she would have loved this evening because I found the holy grail of all grey knits – a gorgeous draped design that literally had every blogger there sighing as it slinked down the catwalk. I have added it to my wishlist and am determined to make it mine this season! 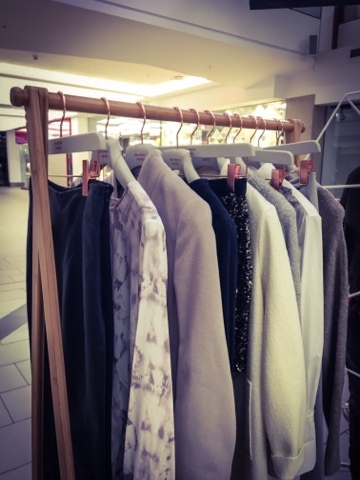 There were also wool coats to die for, beautiful floral chiffon tea dresses that would look amazing with boots and a sparkly skirt in a gold-pewter shade that would be ideal for party season. Inspiring stuff. It was a really lovely evening and I got to catch up with some of my new blogging friends from the East Mids Meet Up, which made it a really fun time. 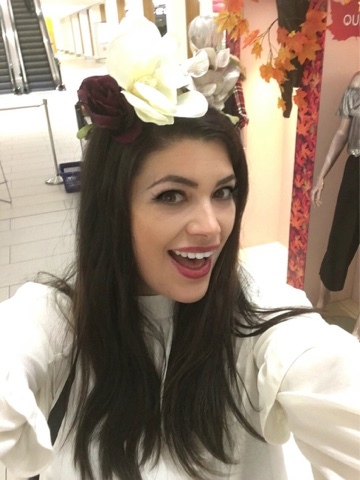 I loved seeing all the fashion inspiration and seeing what the other bloggers were wearing. At the end of the night we also got a lovely gift bag from Sostrene Grenes, which makes super-cute homewares, and that was ever so kind. 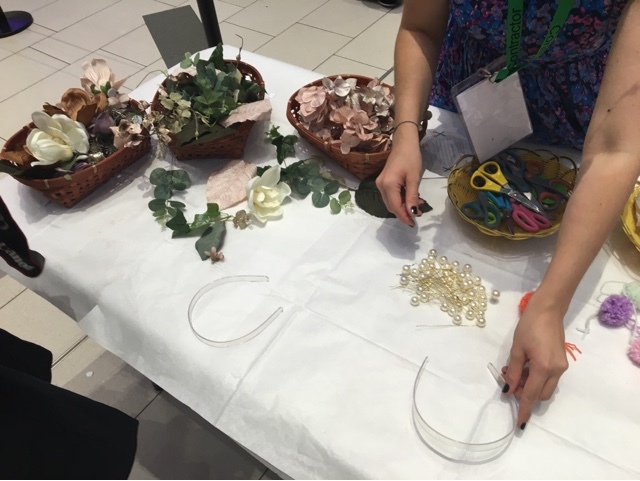 I’m already using the stuff inside so I didn’t get any pictures, but safe to say if you’re looking to update your home décor for the coming season, it would be a great place to start if you’re into quirky, design-led but affordable homewares. 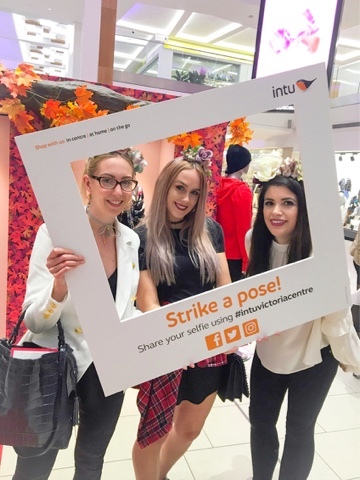 Thank you to Intu Victoria Centre for a brilliant evening.